Definitively destroying confidential documents is easier than it seems, without lighting up a massive bonfire to burn everything! You need a device that is specially designed to do this: A paper shredder. Different types of document shredders are available on the market. Depending on whether you are a homemaker, head of a major firm, or director of an intelligence service, your perception of the word “confidentiality” will be very different. Paper shredding machines are the most common tools that help destroy confidential documents. The advantage of paper shredders is that they can destroy several pages at a time. The pieces are then recovered directly into a closed basket. Some models offer straight cuts, others are crosscuts for optimized safety. Some models are also capable of destroying cards and other hard paper types. Every month there is a bombardment of various documents that contain sensitive information: bank statements, invoices, receipts, list goes on. Sometimes, you might be in possession of confidential company documents that need to be destroyed properly. As one of the best practices for document destruction, sort through these documents and get rid of the ones you do not need. Its always a good option to use a professional paper shredder. Using other methods like burning the papers and throwing the ash in the sink will also get rid of them for good. It’s impossible to extract information from burned out ash, but that method takes more time and makes a much bigger mess! Throwing away papers with sensitive or private information in the trash bin is not safe. Maybe you work for the government or a company that manages confidential data. Throwing these papers in the garbage is not enough to protect them from those who are looking for specific information. To protect yourself from the illegal or malicious use of this information, learn how to destroy these documents. It’s important to follow the best practices for document destruction to keep you and your company safe. A paper shredder is the best choice for document destruction. When you decide on a paper shredder, it is important to use a crosscut mill, not a straight-cut mill, as this will result in finer paper webs. This will prevent people with unauthorized access from piecing together the pages with the strips of paper. Choose a machine that cuts the paper into strips up to 0.5 mm wide and 0.5 cm long. Considering the best practices for document destruction, experts recommend checking the security level of the paper shredder. A higher security measure would indicate how efficiently the machine cuts the paper. Paper mills are available in office supply stores and are classified into several security levels, depending on the smoothness of the cut strips. The more fine bands the machine has, the higher the security level will be. 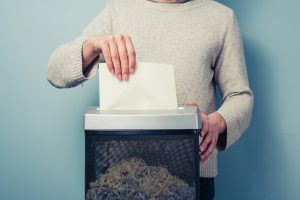 Most companies provide paper shredders that are much more advanced and sophisticated options for document destruction. They offer a higher option for secure paper shredding or other document destruction services. Make it a regular routine to shred your papers. When you have a fixed schedule for document destruction, it will save you and your company plenty of time. An added benefit of having a fixed schedule is that you won’t have to go through a massive pile of sensitive documents. Scheduled shredding is one of the best practices for document destruction. It help minimize the risk of an intentional or unintentional breach in the database. Regular shredding will allow the information not to fall into the wrong hands. What if you have many sensitive documents that need to be destroyed, but do not have the time or the equipment to do it in a secure manner? It’s always one the best practices of document destruction to hire a professional service. Many companies provide expert services for eliminating sensitive documents with confidentiality. These professional services will get rid of your sensitive documents without compromising the trade secrets, client list, and other sensitive company information. It’s always one of the best practices for document destruction to arrange a staff training about properly disposing off documents with sensitive company information. Training your own staff about the document destruction will help keep confidential data safe. Employees, themselves, can be held responsible for theft of trade secrets. Holding each employee accountable for their data is a good practice for document destruction.